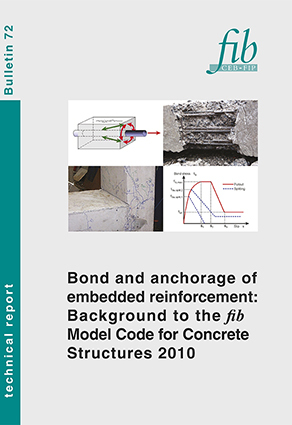 As part of the preparation for the fib Model Code for Concrete Structures 2010, task group 4.5 Bond Models undertook a major review of rules for bond and anchorage of reinforcement in the CEB-FIP Model Code 1990. This bulletin presents the outcome of that review, describes the rationale for the revisions and presents the evidence on which the revisions are based. The principle changes in MC2010 include raising the limit on concrete strength that may be used when determining bond resistance to 110MPa, introduction of a coefficient η4 to cater for different reinforcement Classes, and coverage of new construction materials including epoxy coated and headed bars. The format of design rules has been changed to permit more rational treatment of confinement from concrete cover and transverse reinforcement, the contribution of end hooks and bends for tension bars, and end bearing to compression laps. New guidance is provided covering a range of construction techniques and service environments and the influence of long term degradation. Analyses of various aspects of detailing on performance of laps and anchorages have resulted in discontinuation of the ‘proportion lapped’ factor α6, alterations to requirements of transverse reinforcement at laps, and have resolved inconsistencies in provisions for bundled bars between major national codes. Apparent inconsistencies in existing rules for lapped joints and anchorages and between the local bond/slip model and design rules are also resolved, thus allowing integration of application rules and modelling. Finally, the basis for an attempt to introduce simple detailing rules for laps and anchorages is described.